The wounds are still fresh in the minds, and on the streets, of Vancouver. 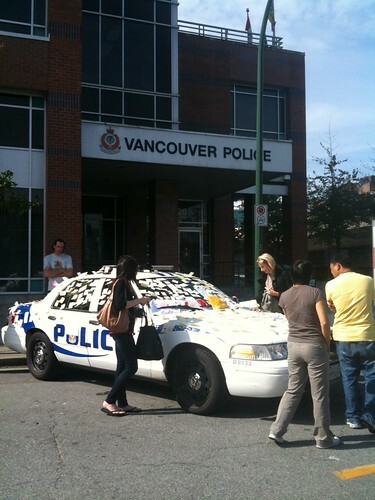 We are angry, frustrated, and embarrassed about what some people made of the beautiful city of Vancouver on June 15th. As people around the world fight for freedom, and against tyranny, we smash cars and windows, ostensibly, because of a hockey game. Much of the outrage heard on talk radio, the blogosphere, and social media itself, is about the so-called cheerleaders who stayed when the police asked everyone to leave. They kept their cell phones running, taking photos and videos, and posting them. In social media circles, this could be called live-blogging. So, did their presence instigate the problem, or were they getting in the way of the Police? Probably a little of both. But the larger question is this: In an age of Citizen Journalism, were they Citizens or Journalists? I guarantee that somebody will offer as defense in court over the next few months that they were exercising journalistic freedom by staying after the police asked them to leave. After all, the traditional media didn’t leave. They were doing a public service, right? And, yet, no doubt, their presence inspired the rioters to continue, too. Here’s the reality: There’s no Press Pass for a riot. So where do we draw the line? If you have a popular blog, are you a journalist? If you have a Facebook page, are you a journalist? Can you see police announce over a loudspeaker: If you have a Klout score below 62, you must immediately leave the area. We’ve seen numerous other “publishing” laws apply to individuals (typically to the Facebook user’s surprise and detriment). In this case, we will see push back from self-styled citizen journalists who claim their presence was no different than the TV camera, or the newspaper photographer. Are they correct? I suppose this will be for the courts to decide. I’m willing to bet some lawyer with a name to make will drag this one as far up the court system as possible. I anxiously await the Supreme Court of Canada’s decision in 2015. As a total aside, love them or hate them, much of the citizen journalists’ content is helping police catch the real instigators. ← Canadian Election Choices … in song.